"Eighth Wonder of the World "
Banaue rice terraces were carved in the mountains of Ifugao Philippines by our ancestors of the Batad Indigenous people. 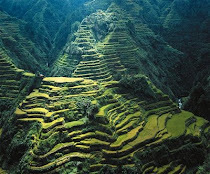 This 2000 year old Banaue rice terraces has also been recognized as one of the "Eighth Wonder of the World". It is the only man made wonder that is sculpted from earth. 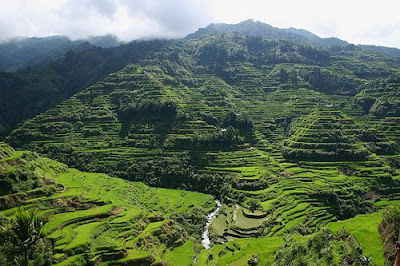 In 1995, Banaue Rice terraces has been declared a UNESCO World Heritage Site. This spectacular creation has been built mostly by hand and minimal only with the use of equipments which shows Ifugaos great craftsmanship and creativity. It is composed of rice fields to provide themselves a source of livelihood in the highlands. 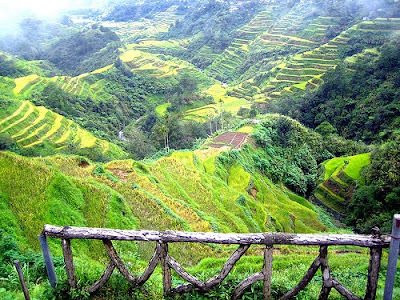 The location of Banaue rice terraces is 1, 500 meters or 5, 000 feet above sea level and it covers 10, 630 square kilometers about 4, 000 square miles of teh mountainside. This wonder has been fully maintained by an ancient irrigation system from the rainforest above the terraces. This place is greatly known as well as a great tourist destination in the Philippines because aside from its stairway design heading to the sky, there are a lot of hiking trails in the area. 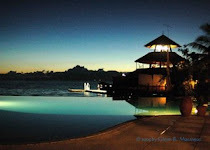 It is located north of Manila at Cordillera Mountain Province. 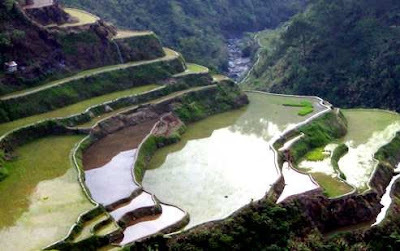 If Banaue rice terraces will be connected end to end, the length is ten times longer than the Great Wall of China. (During peak seasons or holy week, you have to at least reserve ticket on week or 3 days before trip whenever possible). Ticket will cost around PHP 290 (approx. 6 to 7 USD). Trips are usually daily. The trip will usually take you around 8 to 9 hours. 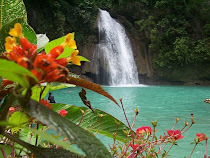 The trip will pass by Neighboring Provinces of Nueva Vizcaya, Bayombong, Solano, Bambang. You will arrive around 5 to 6 am the next day. as of this date, Auto Bus does not operate unlike in the past. I'm not sure if Dangwa is also operating, but you can take a ride almost every afternoon only near the Rizal Park (in Baguio City). There are buses and mini buses station. You just need to check out the trip schedules because almost everyday, they are changing. This trip will take you from Baguio going down to Carmen, making a let turn to the junction going to Vizcaya, heading east, then a turn from San Jose going up north making your way to Solano or Bayombong The trip will also bore you a long 9 hour haul. On the other hand, you can settle by riding three different trips: Baguio to Sagada or go directly to Bontoc, taking the trip from either Slaughter House or at the back of Centermall, simply known as Dangwa Terminal. The trip will usually take you 5-6 hours. The trip usually starts around 6 am, taking the Halsema Highway route. If you take the Sagada trip and arriving at the area, it is impossible to leave the place without making your way around, but If you are in a hurry, you can either rent a jeepney going to Bontoc or settle for the next day. It will usually take you around 1 to 2 hours to reach Bontoc. Bontoc is a central part of the transportation link. you can actually go directly to Baguio or Banaue or Sagada. From Bontoc, there are jeepneys that have limited schedules, so an inquiry from locals is recommended. 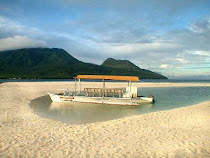 You can take a jeepney trip between 8 am to 10 am. You can ask the locals of what time the trip is in the afternoon. 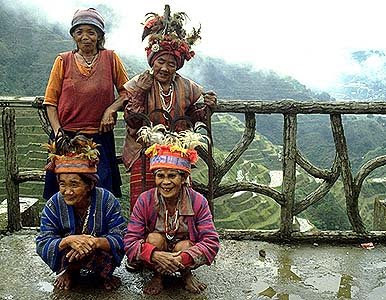 The trip will usually take you 1.5 to 2 hours going to Banaue. 2. The Banaue Hotel, a ten-minute walk out of the southern side of town. An average standard room will cost you around PHP 1500 or around 30 to 35 USD, will all the comforts, spacious hotel lobbies and panoramic views of the place. 3. There are several residents who would want to accept transient boarders. Near the Banaue town proper however, there are server lodging houses and all are at very reasonable prices, so accommodation is almost not a problem. like to know if we can feature ur blog in our mags..